Chavanga Fish Blog: Kola river salmon fishing. Details. Kola river salmon fishing. Details. River Kola is interesting for anglers who want to catch a big salmon. Indeed, for many years the river gives us that opportunity. Despite the proximity of Murmansk and other settlements in the Kola River there are enough big fish. We must realize that, contrary to naive advertising is not easy to catch a really big fish. 'll Need all your skill and the help of our guides. We are pleased to inform you that in addition to the possibility of meeting with a large salmon, we can offer you accommodation on the river in a really comfortable environment for real-life, not overpriced at 10 times the price. 1. Transfer from the airport or train station of Murmansk to the Caravelle Hotel and back. It is the same for all types of tours. Anyone can come in their own cars. The hotel has a guarded parking. On the 2nd and 3rd floors we have family rooms. 4th floor- bar, billiards, karaoke, darts, etc. Dinner (breakfast) is supplied by individual orders or a la carte restaurant, the menu is made on the week and posted on the 1st floor. Breakfast consists of 4-5 meals, lunch from 3-4, dinner from 3-5 dishes prepared by professional chef. During fishng day guide takes lunch to the river in a thermos, and in agreement with the client served lunch on the river. Dining maybe 3 or 2 times a day. Fresh fruits are available on the table constantly, tea and coffee set too. Alcohol is not included in the price. 3. We have fireplace room, 2 steam rooms and swimming pool, paid separately and it is not included in the price. At the request of fishermen dinner can be served in the bath. If you want - night fishing for those who wish to catch at night (from 23.00-05.00 June, July), paid separately. 5. The guide works with 1-2 anglers or with 3 anglers during walking version of fishing day. His responsibilities include SECURITY client, site selection, aid in the fight with the fish and its releasing, photo and video shooting at the request of the client, lunch on the river, rafting boats (only a portion of Kola-3), selection of flies, training fly fishing, the first medical aid. A good insect repellent available. 6. Fishing Plan : fishing plan drawn up for all the days before the arrival of fishing but given his wishes. The plan is posted on the 1st floor. With new customers go to work only the most experienced guides. 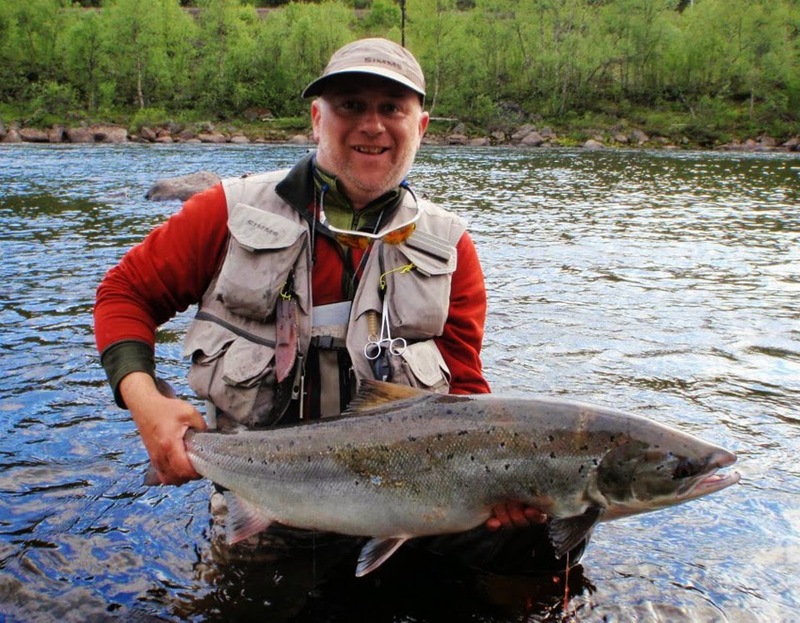 On June 1, fishing is carried out in the area 3-Kola, Kitsa where there is a 100% chance to catch a big fish spring. 3-1 day. Fishing on the Kola-3, "Monica pool." 4th day. Fishing on Quitzé, Bridge pool and walk on foot along the river to the base (3 km). Day 5. Fishing at Ura. 6th day of fishing at Ura. 7th day. Fishing on the Kola-3, alloy or 1-Kola or Ura. Check-in is not required to plan only for a full week, but it is desirable to have a minimum of 3-4 days. Depending on the number of groups will anglers one portion 1 or 2 times. With no outlet for fishing angler it has the right to take the place of another angler group. Delivery to the site 3-Kola organized by minibus. The distance from the bus parking to the river is only 200-300 meters . .
8. The basic package includes: Transportation, meals, lodging, licenses, guide (with the boat), reasonable quantity of flies, transportation to the place of fishing, casting technique learning. Price is determined by the order of living conditions and nutrition. The rest is fixed. June .................. 1850 euros all inclusive. 9. Orthodox cherch on a hotel territory. 10. All anglers branded cap as a gift.